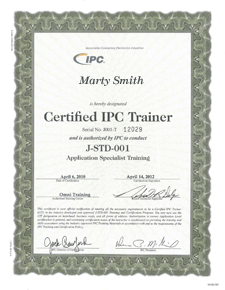 What is J-STD-001 Class 3 certification? To be J-STD-001 Class 3 certified, a technician must follow a number of protocols (incl. IPC J Standard) related to materials, methods and verification when soldering complex electronic interconnections. The standard ensures high quality J Standard Soldering and emphasizes process control for a wide range of electronic manufacturing products and services. 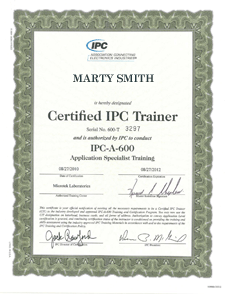 All of our technicians at FastSMT are J-STD-001 Class 3 certified solderers as certified by IPC. A J-STD-001 compliant manufacturing facility is controlled for electro-static discharge (ESD), humidity and temperature according to ANSI/ESD-S-20.20. J-STD-001 Certified Solderers are trained 40 hours for the proper soldering techniques that ensure high reliability of solder joints for high performance electronics. Solder purity and flux requirements adhere to J-STD-006 and J-STD-004 respectively. J-STD-001 has cleanliness requirements that are specified and met. J-STD-001 requires Moisture Sensitive Devices (MSDs) to be handled according to J-STD-033 specification with a controlled procedures. Basic PCB acceptability requirements are specified according to IPC-A-600. The manufacturer shall maintain operating procedures describing the soldering process and the proper operation of the automatic soldering machine and associated equipment. Statistical Process Control (SPC). In a J-STD-001 compliant facility, SPC is used in SMT reflow and wave soldering processes. A J-STD-001 compliant facility requires Ball Grid Array (BGAs) to be evaluated by X-Ray images to allow assessment of the characteristics specified for dimensional and solder fillet requirements.